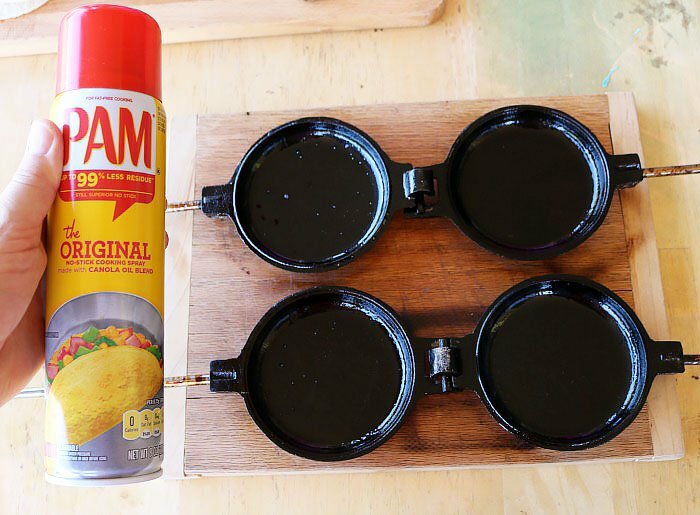 Next time you you plan to make tacos on a camping trip, try making pie iron tacos instead. Everything tastes better in pie irons and tacos are no exception. The ingredients are the same, the only difference is in the cooking. Pie irons lend their unique smokey flavor to whatever you put in them. 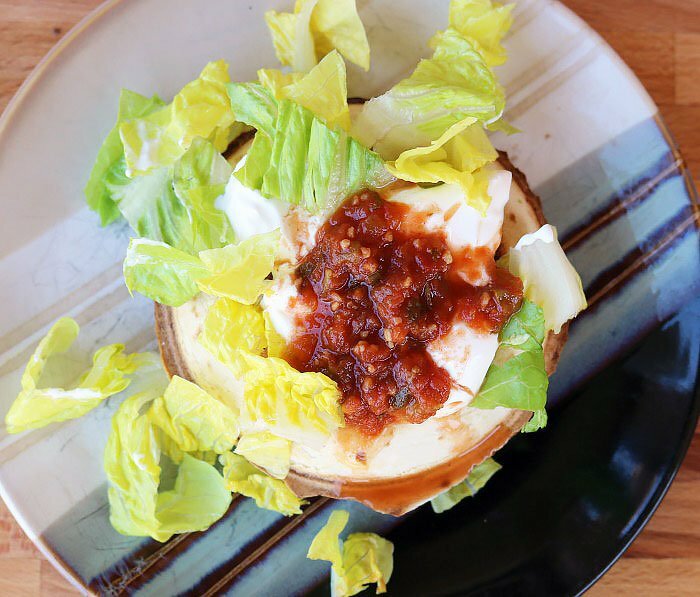 With minimal prep at home, you can cook an amazing lunch or dinner on your next camping trip. 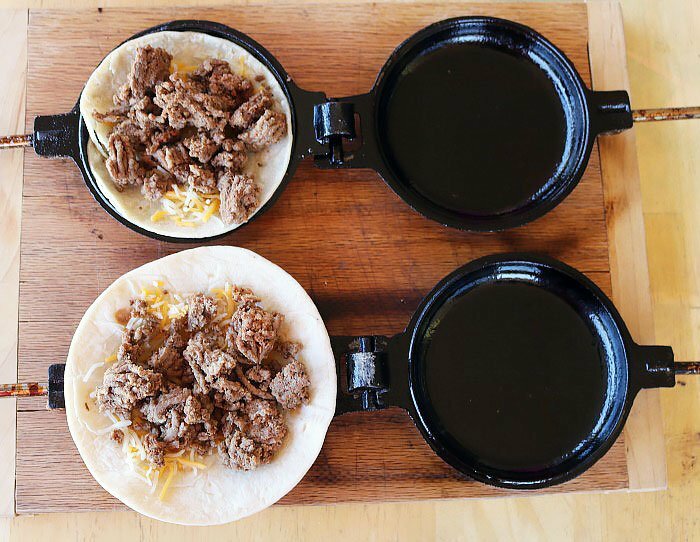 Pie iron tacos are an ideal camping food – quick to assemble and cook, easily customizable, and highly delicious! Corn or flour tortillas work great – it’s up to you what you prefer! Also – the skies the limit on toppings and add-ins. Jalapenos and/or chiles work great inside the pie iron tacos. 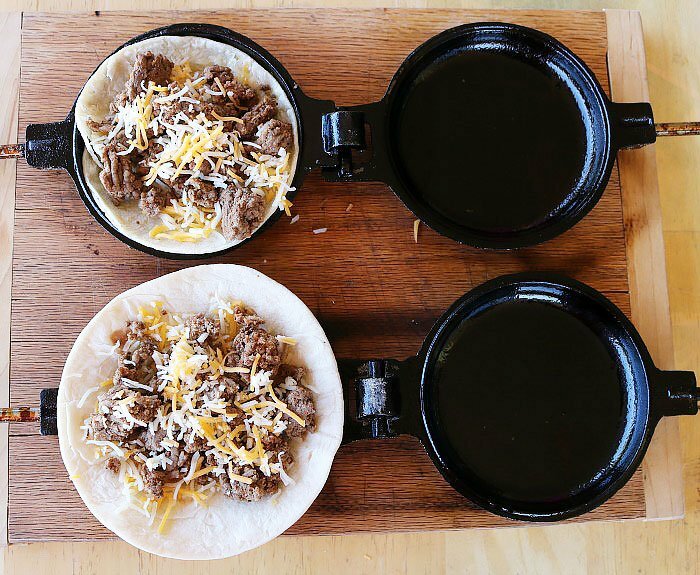 Anything that is better cold would work better as toppings after the tacos are cooked. Doing a little bit of prep work before you leave home makes sense with this recipe so that it’s only assembly and cooking of the tacos. Of course, you don’t have to do these things beforehand, but a few minutes at home will save you the hassle at the campsite. 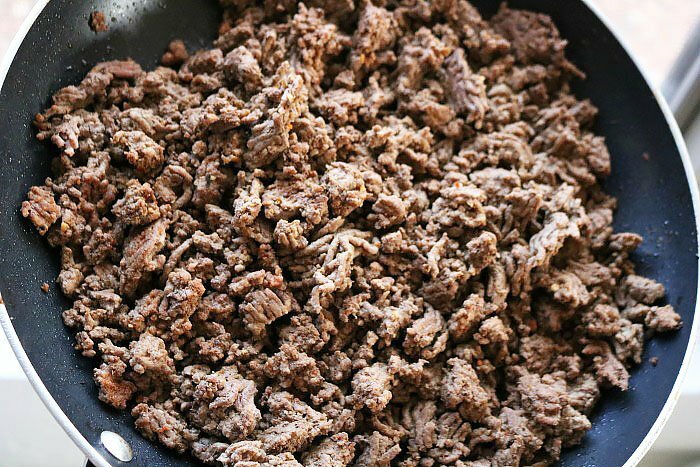 Place ground meat and taco seasoning in a skillet over medium heat and cook until browned. While cooking, use a spatula to break the ground beef into small chunks. Once the meat has cooled, place it in a plastic ziptop bag and refrigerate until you’re ready to put it in your cooler to bring to the campsite. Next, chop your veggies. If you’re not bringing any – no work required! It’s easier to chop lettuce, jalapenos, tomatoes, etc in your home kitchen. Place these in plastic ziptop bags as well so that they’re ready to grab and go. First thing you’ll need to do is get your cooking area ready. Pie irons work the best when used over red hot coals or white hot briquettes. When the coals or briquettes are getting close – you’ll also want to place your pie irons in to preheat. Once your pie irons are preheated, carefully pull them off of the heat and place on a heat proof surface. Spray each inside with cooking spray. Place a tortilla on one side of each pair. Add some grated cheese. Next, add ground meat on top of the cheese. Then, add a sprinkle of cheese on top of the meat (the cheese on either side helps the whole thing to stick together when you’re cooking it). 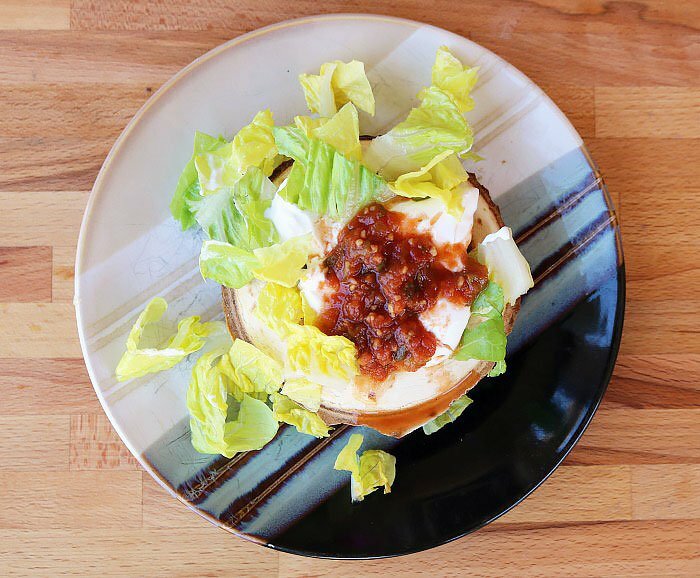 Finally, place the second tortilla on top of the filling. Close the lid (make sure you clip them) and using the knife carefully (remember the pie irons are hot!) cut off the excess tortilla that hangs out. Place the pie irons in the coals for approximately 5 minutes on one side, then flip to the other for about 3 more minutes. Check for doneness and if the cheese isn’t melted, cook for a minute or two more. 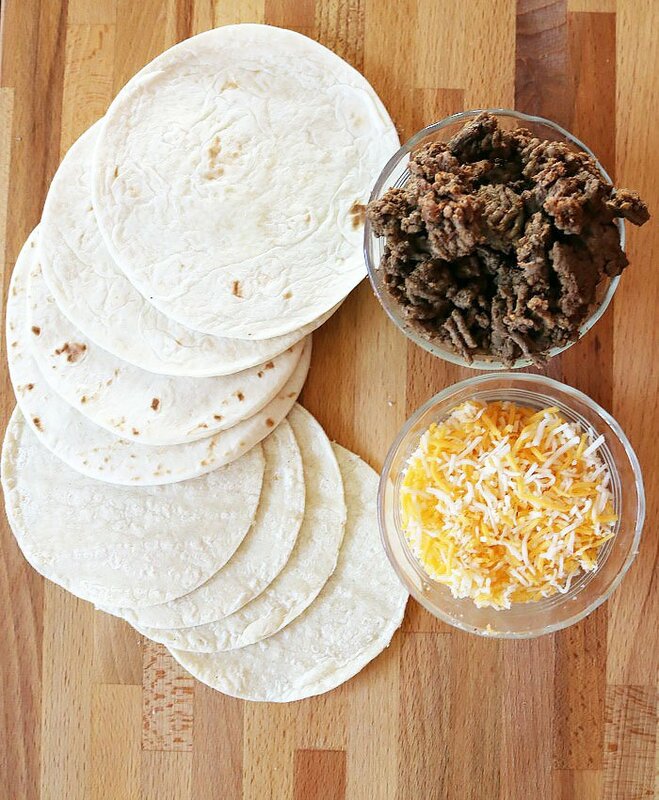 Your tacos will be done when the tortilla is lightly browned and the meat and cheese are nicely warmed up and melted together. 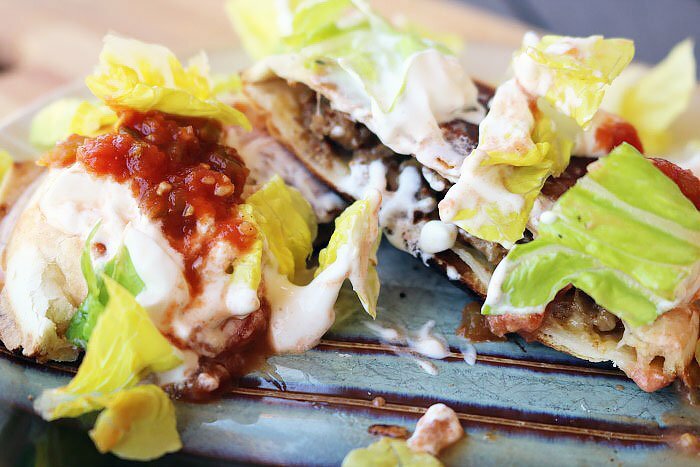 The cooked tacos should look something like this. The reason for removing the extra tortilla can be seen in the picture above. Whatever tortilla is hanging out will burn in the coals. It’s generally easier to remove it before you cook, but as you can tell it’s okay to remove it afterwards as well. Just be aware that you’ll smell burning tortilla while it cooks! 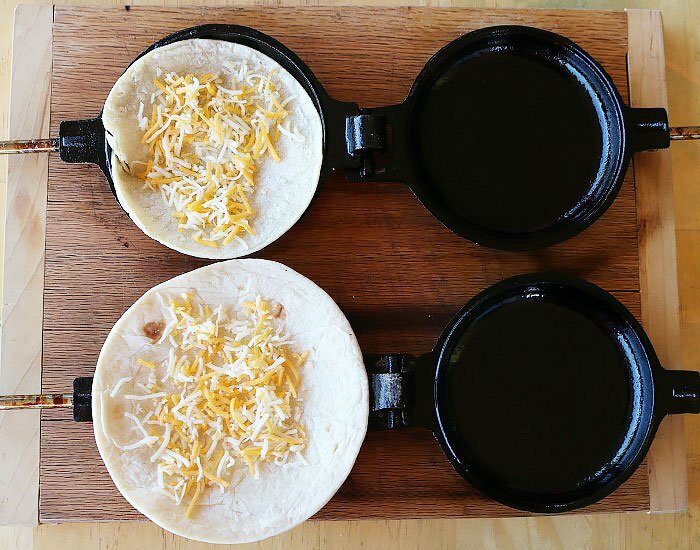 Once your tacos are cooked, carefully remove them from the pie irons. 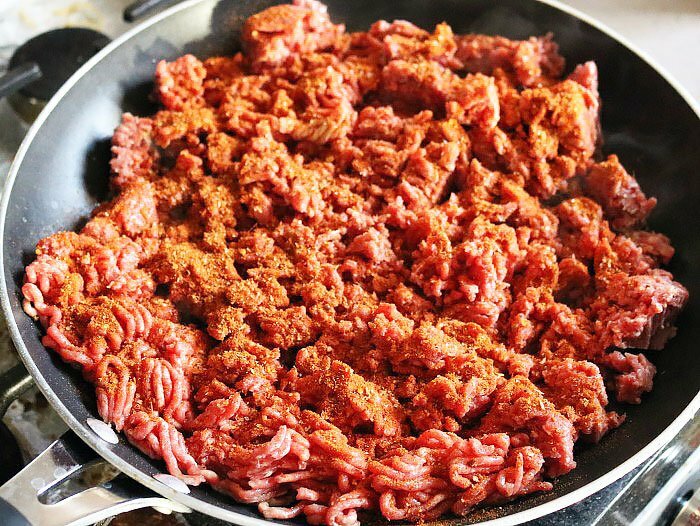 Place ground meat and taco seasoning in a skillet over medium heat and cook until browned. Break ground beef into small chunks with a spatula. Cool meat and then place into a plastic ziptop bag. Refrigerate. Chop veggies. Place them into a plastic ziptop bag and refrigerate. 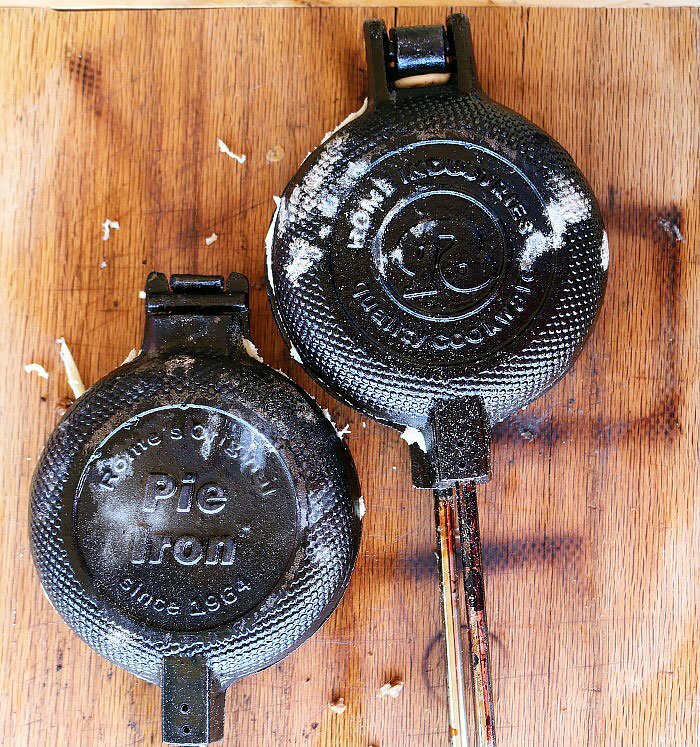 Remove pie irons from fire and spray insides with cooking spray. 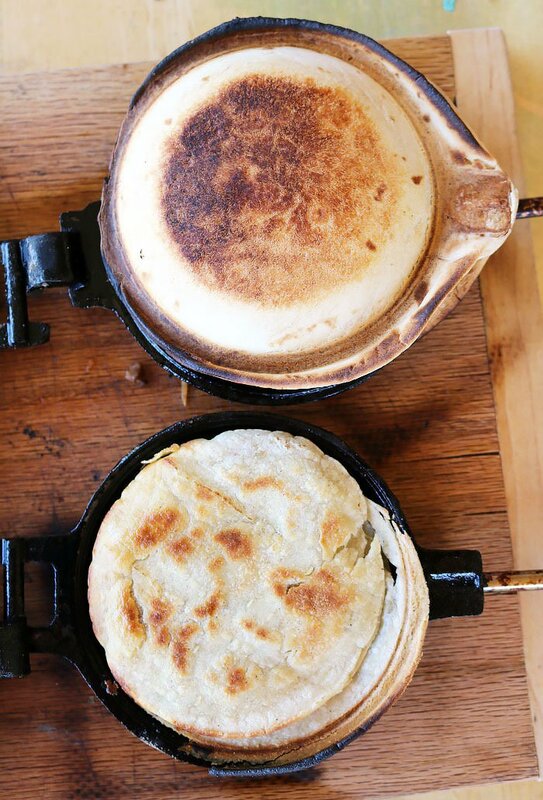 Place a tortilla on one side of the pie iron. Add grated cheese on top of the tortilla. Add meat on top of the tortilla and another sprinkle of grated cheese. Place the second tortilla on top of the meat mixture. Close and clip your pie irons. 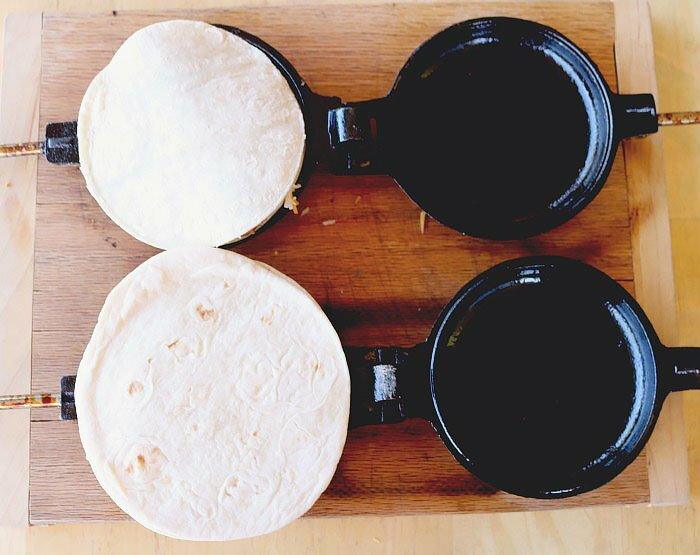 Cut off any tortilla that is sticking out of the pie iron. 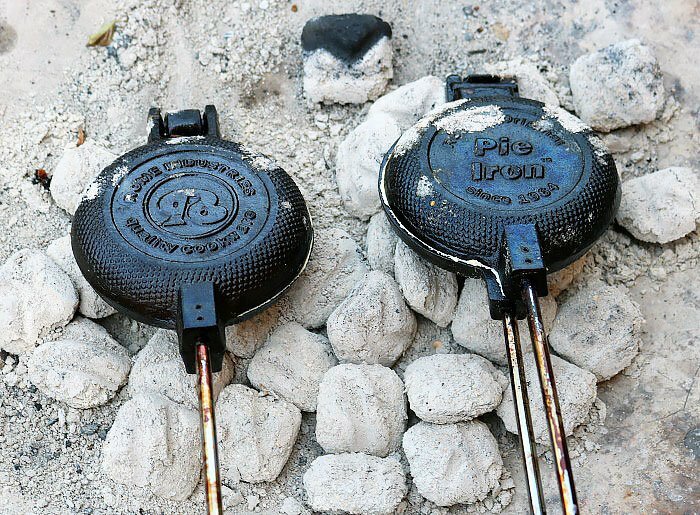 Place pie irons in the coals for 5 minutes on one side. Flip and cook for approximately 2-3 more minutes on the other side. 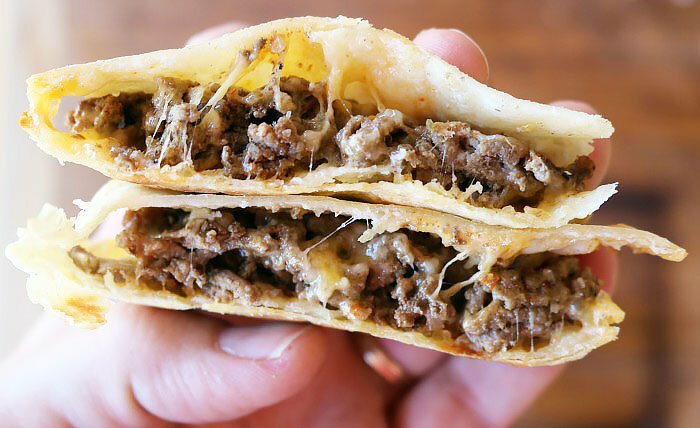 Pie iron tacos are done when the tortilla is lightly browned and the meat/cheese mixture is warm and melted. 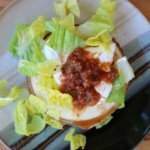 Cover with desired toppings and enjoy!